Chazz has been entertaining crowds where ever he goes, whether it is a simple one on one card trick or amazing stage spectacles. Chazz's brand of magic has been known to captivate his audiences and makes sure everyone leaves with a smile on their face. He combines amazing magic with side-splitting comedy. 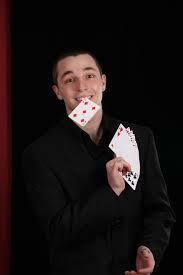 You will be amazed as you watch his astounding feats of illusion, sleight-of-hand, and mentalism. Mixing his brand of humor with his magical styling, he provides experiences which no one can forget.